RIO DE JANEIRO, BRAZIL – With the 2016 Olympic Games just a mere fifty days away, on Tuesday, June 14th, the Rio 2016 organizing committee revealed “A new world” as the official motto of the 2016 Games. Thomas Bach, the president of the International Olympic Committee (IOC) unveiled the slogan at a special ceremony held at Olympic Park in Barra da Tijuca. 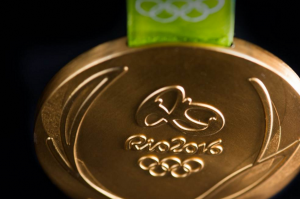 The Games also unveiling the designs for the 2,488 gold, silver, and bronze medals, photo by Alex Ferro/Rio 2016. The creation of a slogan is a tradition of each Olympic Games. Previous Olympic mottos included “Welcome home” for Athens in 2004, “One world, one dream” for Beijing in 2008, and “Inspire a Generation” for London in 2012. Now, A new world will be the front and center message that will be transmitted around the world in the lead-up to and during the 2016 Games, which start on August 5th. In addition to revealing the official slogan, on Tuesday, the organizing committee made a series of other announcements to mark the final countdown to the Games, including unveiling the designs for the 2,488 gold, silver, and bronze medals that ten thousand elite athletes will soon be competing for. The medals have been made with an eye on sustainability, with the gold medals produced without mercury, and the silver and bronze medals using thirty percent recycled materials. A unique feature of the Paralympic medals is a device inserted in each medal that makes a certain noise when shaken, allowing visually impaired athletes to differentiate a gold, silver, or bronze medal.